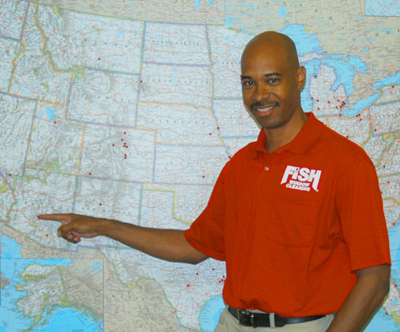 Welcome to Fish Window Cleaning Phoenix AZ! We are your local window cleaning company serving homes and businesses. We also serve commercial and residential customers in Scottsdale, Paradise Valley, Fountain Hills, Cave Creek, Pinnacle Peak Village, and Reata Pass, AZ! Click here to visit our Scottsdale website. We provide only the highest quality window cleaning services and we have over 125,000 satisfied customers nationwide! Take a look at what their saying about us! "Fish Window Cleaning is professional, friendly, courteous and does an excellent job on cleaning our windows." How nice would it be to never have to worry about how your windows look again? We can make this dream a reality with our maintenance programs! We can make sure your windows are sparkling and beautiful before the holidays, when spring cleaning rolls around, next week, and for any other occasion. We can also clean your gutters, chandeliers, mirrors and more so you will not only check window cleaning off your to-do list but a wide range of other tasks. Think about everything else you have to do at work or at home. Do you really want to spend your free time cleaning the windows? Let the professionals do this hard, time consuming work for you! We are committed to your satisfaction! Click here for more information on our residential services. We know that the success of your business is more important to you than keeping your windows clean. You and your employees are probably tired of wiping off smudges and attempting to reach the tops of those storefront windows too. Let us take care of this for you so you can focus on the more important aspects of your business! We offer customizable cleaning programs ranging from weekly to annually, tailoring our services to meet your needs, budget, and schedule. Our professional, uniformed team is licensed, bonded, and insured to ensure the protection of our customers as well as our cleaners. Click here for more information on our commercial services. We are committed to your satisfaction. We think it's important to maintain the trust and respect of our customers. That's why we are committed to your satisfaction. Our estimates are always detailed, free, and you have no obligation. No contracts are ever required. Our professional team is uniformed and trained with our premier safety program. We'll be there when we say we'll be there. We are always looking for professionals to join our window cleaning team! Click on the available job openings below to submit an application online!